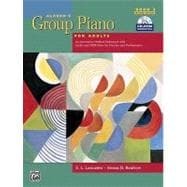 The Second Edition of Alfred's Group Piano for Adults, Book 2 includes updates inspired by numerous recommendations from group piano teachers and students. This book includes a CD-ROM containing both Audio and General MIDI Files of the 500+ accompaniments included in the text, each with an interesting and engaging arrangement coupled with the piano part. Designed for collegiate non-keyboard music majors with little or no keyboard experience, the easy-to-use text contains 26 units, each intended to be covered in one week, thus fulfilling two semesters or three quarters of study. Theory, technique, sight-reading, repertoire, harmonization, improvisation and ensemble activities are taught thoroughly and consistently throughout the text. Book 2 is 408 pages.